The red grape variety comes from Spain. The main synonyms are grouped alphabetically by country are Carignan, Carignane, Carignan Noir, Pinot d'Evora ( France ); Bovale di Spagna, Bovale Grande, Bovale Mannu, Carignano, Tintiglia ( Italy. Sardinia ); Carignane, Kerrigan ( California ); Cariñano, Cariñena, Crujillón, Mazuela, Mollard, Samsó, Samsó Crusillo, Tinta Mazuela, Tintilia, Tintillosa, Zinzillosa ( Spain ). Despite seemingly indicative synonyms or morphological She may not share similarities with the varieties Bobal. Cinsault (Samsó) Graciano (Bovale Sardo), Mollard. Nieddera. Parraleta. Pascale or Tintilia del Molise be confused. The probably very old variety probably comes from Aragon, From here it spread from the 12th century throughout Europe. The current main name Mazuelo is from the municipality Mazuelo de Muñó in the province of Burgos in the western border region Castile and Leon derived. The synonym Cariñena probably refers to the same place near Zaragoza in Aragon. This in France Carignan (Noir) and Italy Carignano has become. The name Cariñena used to be very common in Catalonia. However, since there is a DO area of ​​the same name, the variety is now referred to as Samsó . And according to done in 2007 DNA analysis is also the native of Sardinia Bovale di Spagna identical. 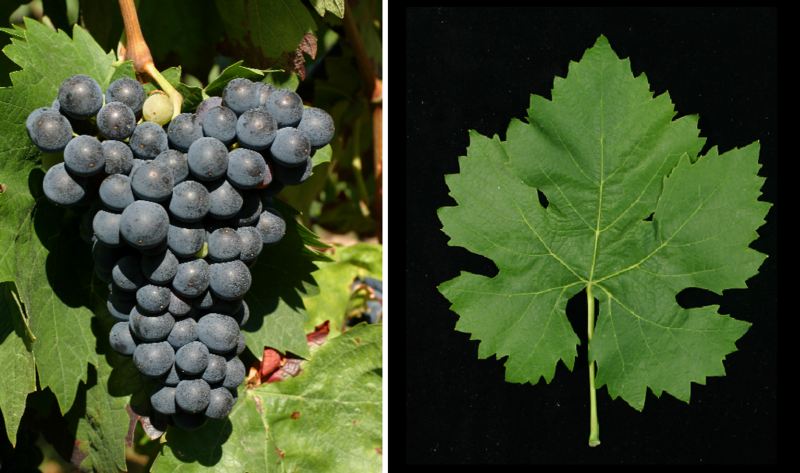 The late-ripening, extremely productive vine is both mildews and Botrytis, but resistant to Black spots disease, It produces deep-dark, acid and tannin-rich wines, but without special flavor and profile. Mostly it is therefore with other varieties like Cinsault and Garnacha Tinta (Grenache Noir) blended into simple rosé and red wines for quick enjoyment. However, with rigorous restrictions on yields, it is possible to produce wines that are full of character, profoundly profound, and surprisingly elegant, even at higher alcohol contents, especially from old vines. The number of impressive wines of this kind is constantly increasing. In Algeria In the early 1960s, the variety harvested 140,000 hectares, and huge quantities of wine were transported to the mother country for waste. As thousands of French winemakers due to the Algerian independence in 1962 after France She was planted here on a large scale. For a long time she was the most common French grape variety. The tendency has been falling sharply since the 1970s, old vines are no longer replaced. In 2010, however, the acreage was still 53,155 hectares, of which around 80% were in the region Languedoc-Roussillon in the départements Aude and Hérault, The other stocks are in the southeast. The famous aperitif Byrrh is produced mainly from Carignan. In Italy she is especially up Sardinia common where they are in the DOC wines Campidano di Terralba. Carignano del Sulcis and Mandrolisai is allowed. In the region Lazio she is in the DOC wine Cerveteri represented. The Italian acreage totaled 2,023 hectares. In Spain she is mostly in Aragon. Catalonia. La Mancha. Navarra and Rioja grown. The Spanish acreage totaled 4,749 hectares. Other countries in Europe or North Africa are Algeria (7,550 ha), Greece (16 ha), Israel (971 ha), Croatia (34 ha), Morocco (1,692 ha), Portugal (338 ha), Tunisia (7,576 ha), Turkey (84 ha) and Cyprus (481 ha). Overseas, there are cultivated areas in Argentina (29 ha), Chile (477 ha), Mexico (448 ha), Myanmar (4 ha), South Africa (81 ha) and Uruguay, as well as in the US states California (1,373 ha) and Washington, The variety took in 2010 a total of 80,178 hectares of vineyards. Compared to 1990 with then 202,869 hectares this was an extreme reduction by almost two-thirds. It occupies it in the worldwide varieties ranking the rank 11. This page was last modified at 18 November 2018 at 18:52.